Successful Connecticut Business Man … – Atria, Inc. In honor of Earth Day, I spoke with one of Connecticut’s most inspirational sustainable business owners I know. 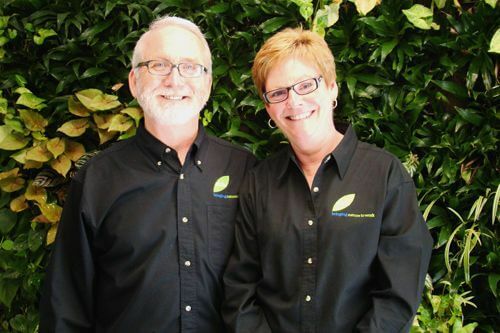 Bruce Crowle, Co-Owner with his wife Joanne, of Atria Inc. shares some insight on the good, the difficult, and the rewarding elements of operating a sustainable business. How do you personally define sustainability? The word Sustainable is an adjective meaning ‘to maintain at a certain rate or level’. Today’s green initiatives are focusing on maintaining our planets environment at its present level for all future generations. We can only hope it’s not too late to actually reverse some of the consequences we have helped to create. To be sustainable we first have to accept that every positive action we take will help improve the environment, or at the very least, not hurt it. What was the impetus/reason for pursuing more sustainable business practices? I think it’s important that you personally believe ‘baby steps’ are required and cumulatively those steps will have a positive impact. Our staff has embraced Atria’s sustainable position with open arms and with conviction. They’ve helped create our policy and practices and are always looking for any way to help reduce, reuse and recycle. I’d say several of those choices played an important role in developing and putting into practice Atria’s sustainable policy. I did experience some early inspiration back in 1973 while undertaking my senior thesis project. That involved studying oxygen levels of a cluster of small ponds in North Carolina over a 6 month period of time. The thesis concluded that when fertilizer was applied to improve surrounding grass or crops it had a measurable impact down stream (increased algae and corresponding decrease of oxygen). From this I learned that the balance within all ecosystems is fragile and that man has the greatest influence on the environment. That’s when I first really started to care how I impacted my immediate environment. Most of Atria’s veteran staff had horticultural background before they joined us. I believe horticulturist’s have a predisposition for sustainable practices. It’s not hard to convince us that we all need to do our part to help improve the environment. I’d say that Atria has practiced and preached sustainability because we are in the business of providing plants for interior environments and we’ve known that their presence helps reduce volatile organic compounds (VOC’s). These gases are introduced into the space by the furniture, paint, carpeting and cleaning solutions and are the cause of poor indoor air quality. What value has sustainable principles and practices brought your company? The most value we get out of our company concern for the environment is our group pride in taking a leadership position. Atria was the very first company in the country to earn Platinum status in the Green Earth – Green Plants® Certification Program, the accreditation program for interior plantscape businesses. Our sustainable practices and efforts helped develop sound standards for environmentally-safe practices within our industry. What were some of the challenges or barriers you face? Another challenge was time management. Many of the policies we put in place, such as composting all of our old plant material, takes longer than simply tossing them into the trash. Each plant is taken out of their plastic grow pot, brought to the compost pile on our property, and the pots put in the recycle bin. We also have a comprehensive recycling program that includes recycling and re-using packaging and composting all organic materials related to our products, as well as employee led efforts to collect and recycle office materials. Our industry has always believed and communicated the fact that our products, which include interior tropical plants, live flowers, green walls and green roofs, all benefit the environment in a very positive way. In the last twenty plus years universities and college researchers have documented the many critical benefits of including well designed and professionally maintained interior plants in the office, shopping malls and homes. Those benefits include the absorption of noise pollution, increased HVAC efficiency (cost reduction), improving healthy humidity levels and most importantly reducing employee stress at work. Where do you see your industry in five years? Looking ahead, I believe that the inclusion of plants, green walls and roofs will be the norm for new construction projects and LEED certification credits will include plants. Cities will use live roofs to cut down on pollution, green walls and large atriums will be more prevalent in hospitals, universities and in corporate settings. This has been the case for many years in places like South America, Europe and Asia, and in some cities here in the U.S. as well.